Today we mark World Social Work Day to increase attention and political will for greater planning, development and support to the social service workforce. Celebrated the second Tuesday in March annually since 1983, World Social Work Day celebrates the achievements of social workers and other vital cadres of the social service workforce in improving the health and well-being of individuals and communities where they live and work. The social service workforce, comprised of social workers and many other paid and unpaid governmental and non-governmental workers, is often undervalued and doesn’t receive the national and global recognition and support needed to ensure an appropriate number of trained workers are available to meet the needs of their communities. Sustainable Development Goal 16.2 calls for ending all forms of violence against children. Approximately 1 billion children worldwide have experienced physical, sexual, or psychological violence in the last year alone. This places a huge burden upon the social service workforce. The consequences of physical, psychological, and sexual violence against children can be as high as $7 trillion. In the East Asia and Pacific US, the cost is equivalent to 2 percent of the region’s GDP. Social workers and others in the social service workforce play a vital role in preventing and addressing violence. Collaboration with other allied workforces is necessary to link children to services, including health care, mental health, and psychosocial support, HIV-related services, child protection, legal assistance, and government benefits they may be entitled to. In 2013, UNICEF launched the #ENDViolence initiative and developed the Ending Violence Against Children: Six Strategies for Action.Community volunteers, para professional workers, child and youth care workers, child protection officers and social workers, among other specialized frontline social service workers, have an important role in implementation of these strategies. They live and work in the community and are first responders in helping vulnerable children and families. During the 34th regular session of the Human Rights Council, the Special Representative of the Secretary General on Violence against Children, Maria Santos Pais, outlined the importance of strengthening multisectoral partnerships and mobilizing significant resources to meet violence-related targets set in the 2030 Agenda. Data has been gathered through national child protection surveys in 14 countries to document the magnitude, nature, and impact of violence against children. The data is intended to inform policy, planning and budgeting. Yet the social service workforce needs greater planning, development, and support to ensure the right number of workers with appropriate training are positioned to meet the needs of vulnerable populations. In Indonesia, for example, according to The State of the Social Service Workforce 2015 Report the current ratio of 1 social service worker for every 38,551 people is inadequate. To raise the profile of these workers, the Association of Social Workers in Indonesia is launching a campaign to time with World Social Work Day to attract more social work students. In Cambodia, there are only three higher degree programs for social work students. Limited university-level training has resulted in a lack of recognition and support for the social work profession from communities, NGOs, and the government. Social Services of Cambodia is partnering with other NGOs on a year-long advocacy campaign, launching this month, aimed at increasing public understanding, and appreciation of the social service workforce. The National Association of Social Workers in the United States is the largest social work association in the world, with 120,000 members. Their month-long advocacy campaign, “Social Workers Stand Up,” demonstrates how social workers stand up for vulnerable groups. The campaign includes proclamations, public service announcements and infographics aimed at promoting national legislation of interest to the profession. Advocacy campaign materials and ideas were shared during a recent webinar hosted by the Alliance. The Global Social Service Workforce Alliance aims to support this work through bringing together groups and individuals in order to provide a forum for discussion, sharing of promising practices and tools, and exchanging innovative approaches toward advocacy, all with the aim of strengthening the social service workforce. To aid members’ efforts in effectively advocating at the national level, the Alliance is creating an advocacy toolkit. 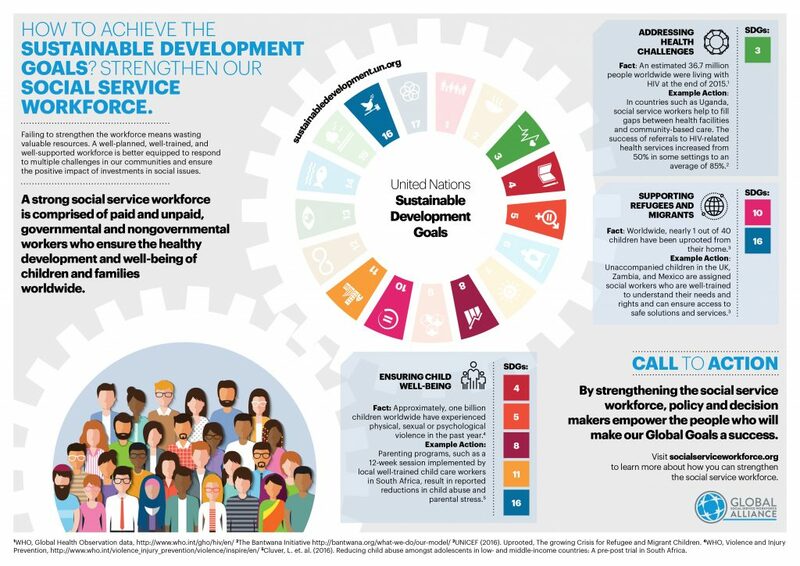 As part of this work, it has developed an infographic aimed at depicting how a strong social service workforce is vital to achieving the Sustainable Development Goals. When these workers are best positioned to protect the youngest, most vulnerable members of the community, the global community benefits. Let’s support the social service workforce in ensuring that a childhood free of violence is not a dream but rather a reality for all children. Established in June 2013, the Global Social Service Workforce Alliance currently has 1,200 members across 100 countries. Learn more on how to support efforts to strengthen this important workforce at socialserviceworkforce.org.